Spongiform encephalopathies are neurodegenerative diseases caused by misfolding of normal cellular prion proteins. A 2014 case of variant Creutzfeldt-Jacob prion disease in the United States was probably caused by eating beef from animals with bovine spongiform encephalopathy (BSE), or mad cow disease. Human spongiform encephalopathies are placed into three groups: infectious, familial or genetic, and sporadic, distinguished by how the disease is acquired initially. In the mid 1980s, a prion disease called bovine spongiform encephalopathy appeared in cows in the United Kingdom. It is believed to have been transmitted to cows by feeding them meat and bone meal, a high protein supplement prepared from the offal of sheep, cattle, pigs, and chicken. Some of the animals prepared for feed likely had a prion disease. Cases of variant Creutzfeld-Jakob disease, a new spongiform encephalopathy of humans, began to appear in 1994 in Great Britain. They were characterized by a lower mean age of the patients (26 years), longer duration of illness, and differences in other clinical and pathological characteristics. Variant Creutzfeldt-Jakob disease (vCJD) is caused by prions transmitted by the consumption of cattle with bovine spongiform encephalopathy. In late 2012 a male Texas resident began showing symptoms of depression and anxiety, followed by delusions, hallucinations, and other changes in behavior. Over the next 18 months the patient’s condition deteriorated, leading to inability to ambulate or speak, and after several episodes of aspiration pneumonia and sepsis the patient died. During the illness prion disease was suspected, but tests for this condition were negative. After death, examination of brain biopsies revealed typical prion plaques, and misfolded prion proteins were found in urine, confirming the diagnosis of variant Creutzfeldt-Jacob disease. The source of the patient’s prion disease was likely consumption of contaminated beef from cows with bovine spongiform encephalopathy. The patient probably acquired the infection in Russia, Lebanon, or Kuwait, three countries that had received BSE-contaminated beef from the UK, and and where he had previously lived. He resided in the US for 14 years before developing symptoms, an incubation period consistent with models of the vCJD epidemic. This Texas patient is the fourth worldwide since 2012 to be diagnosed with vCJD; the others were from the UK and France. There are likely to be additional cases of vCJD in the future: surveys of archived appendix tissues in the UK show that 1 in 2,000 persons born during 1941-1985 have asymptomatic vCJD infection. 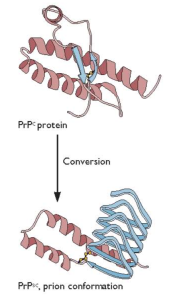 These individuals could transmit the misfolded prion proteins to others via transplantation, blood transfusion, or surgical instruments (prion infectivity is not destroyed by autoclaving). The good news is that vCJD is rare: there have been 230 reported cases of vCJD worldwide caused by consumption of BSE beef. The bad news is that vCJD will probably continue to appear in humans for many years, not only from the aftermath of the BSE epidemic. Rare cows spontaneously develop BSE, and because cattle are slaughtered before disease symptoms are evident, contaminated meat could enter the food supply. Wow! First I’ve heard of them actually knowing about people already infected, from appendix tissue. I hope this is a routine test on people undergoing operations, or on donated organs: If so, it’s been kept pretty quiet over here in the UK. A quick search reveals that it made the news rounds at the time. The original paper (linked to here) is open-access, although the accompanying editorial is not. Although vCJD is rare, but it pose a threaten to people’s health and it may cause a epidemic. So is there a possibility to produce the vaccine of vCJD. Previous post: TWiV #356: Got viruses?